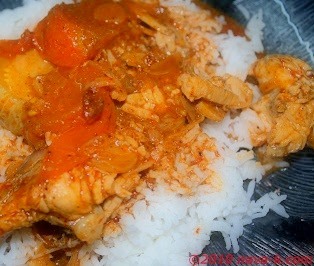 Why Bengali Yogurt Fish Curry (Malaysian Indian Fish Curry)? The change. Change to another fish curry obviously. Can't be always the same fish curry? Of course not. Otherwise, marriage love will slowly fade due to even curry monotony (Chicken Devil Curry, Indian Vegetable Curry & Crab Curry)? Home made, made from a scratch, really from a scratch curry paste Bengali Yogurt Fish Curry. Spices dry fried for aroma releasing and then, blended. Curry paste let me tell you is the power house deliciousness and when cooked alongside the rest of the ingredients as listed below, furthermore, yogurt for the natural burst of creaminess and sourness, oh, what a profound different layers and role play of tastes Bengali Yogurt Fish Curry. **Dry fry ingredients just for a couple of mins to release the aroma. Next, blend/ground with some water for a thick paste. In heated oil, saute shallots, ginger, garlic, fenugreek seeds and mustard seeds. Once seeds splatter, add curry paste. Fry over low heat till aromatic and oil splits. Pour 1 litre of water, add brinjals and tomatoes. 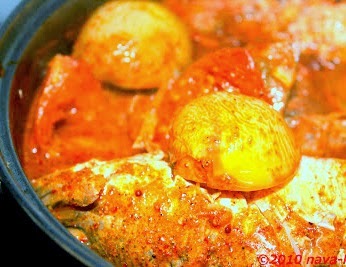 Cook till fish and brinjals are tender. Off the heat and combine in whisked yogurt. .
You are on point with this curry I like how you add the perfect combo in ingredients very appetizing.